SGIM's health policy committee is constantly working in partnership with our elected officials, federal agencies, and other organizations to make our members' voices heard. 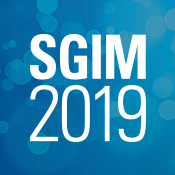 The SGIM19 Preliminary Program is available for downloading - choose your annual meeting path online . The latest issue of SGIM Forum is now available. Read it here.